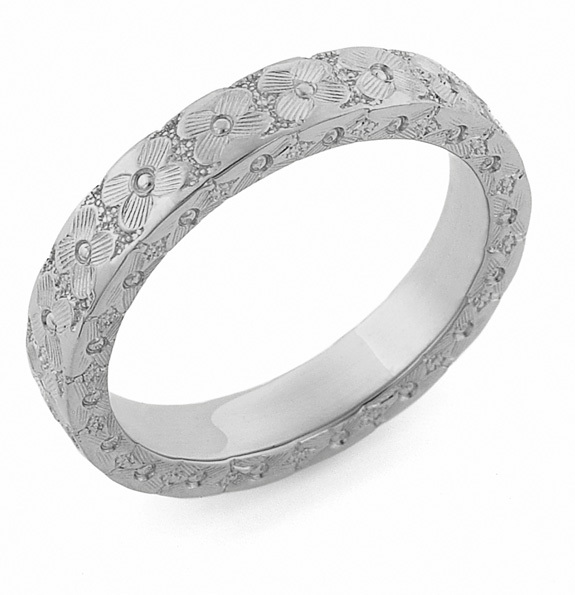 A seamlesss pattern of flowers adorn this platinum floral wedding band ring from Apples of Gold Jewelry. The floral band is made in 950 grade pure platinum and the flower patterns extends along the side of the band, creating a truly unique and stylish designer platinum wedding band ring. The band measures 4mm wide and 2.1mm thick. The ring is available for women in sizes 4.5 - 9. We guarantee our Platinum Hand-Carved Flower Wedding Band Ring to be high quality, authentic jewelry, as described above.